It's Another Milestone For The Dow After Finishing Above 22,000 For The 1st Time : The Two-Way Strong corporate profits have helped keep stock prices rising, and a weaker dollar has benefited companies that sell a lot of products overseas. The Dow Jones industrial average finished above 22,000 for the first time, buoyed by higher corporate profits and low unemployment. 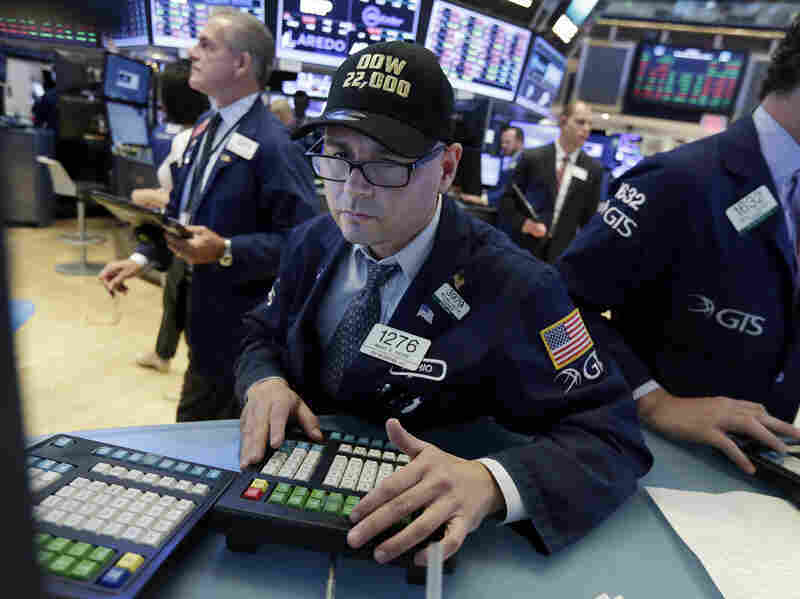 The Dow, the most widely cited stock index in the world, closed Wednesday at a record of 22,016. It is now up 11 percent for the year and more than 20 percent since President Trump's election in November. "Earnings are growing and are growing faster than anybody thought. That alone will drive stock prices up," says Brad McMillan, chief financial officer at Commonwealth Financial Network. "We [also] see improving consumer confidence and business confidence. When investors are more confident, when consumers are more confident, when businesses are more confident, then typically you see stock prices rise," McMillan adds. McMillan says the improved consumer mood is partly due to the strong job market. The U.S. unemployment rate was 4.4 percent in June. Mario Picone, a specialist at the New York Stock Exchange, wears a "Dow 22,000" as he works at his post on the exchange floor. The Trump administration's focus on deregulation may also have helped improve business confidence, he says. Trump himself was quick to take a victory lap this morning after the 22,000 barrier was first breached. "We have a lot of things happening that are really great," he said at the White House, adding, "our country is doing very well." But Jack Ablin, chief investment officer at BMO Private Bank, is skeptical about how much credit the White House deserves. A Trump bump clearly occurred in the first weeks after the election, he says. For instance, investors were betting that big tax cuts were coming, so tax-free municipal bonds suddenly were less attractive. Meanwhile, Trump's promise to renegotiate the North American Free Trade Agreement sent Mexican stocks down. But since then, the effects of the Trump bump have largely reversed themselves, as concerns about Washington dysfunction have risen. Municipal bonds are back up and so are Mexican shares, he says. The current surge in stocks is being driven not by Trump policies but by other factors, such as the falling dollar, which has made U.S. companies cheaper overseas, Ablin believes. "Caterpillar, for example, had record earnings, fantastic earnings, this last quarter, a lot of it due to the fact that their business is in the emerging world, in Asia. There's a lot of demand there," Ablin says. The Dow is made up of 30 large, blue-chip companies, many of which sell heavily overseas. They include McDonald's, Boeing and Apple, which released a better-than-expected sales forecast on Wednesday.